(CNN) - Mitt Romney's senior adviser Ed Gillespie said Wednesday in a CNN interview that he did not know when his candidate would balance the federal budget, the day after Romney's new vice presidential candidate, House Budget Committee Chairman Paul Ryan, said the campaign had not yet "run the numbers." 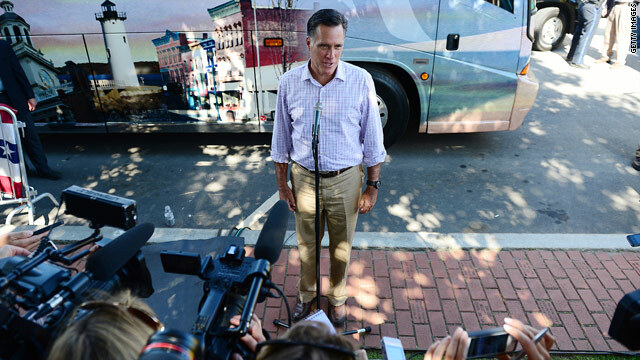 Romney, meanwhile, was on the campaign trail this week praising Ohio Gov. John Kasich's understanding "that it's government's job to balance budgets" and saying his plan would "get us to a balanced budget faster than the plan [Ryan] originally put forward" - while providing few details about how he would balance the federal budget, which he said in June would be reached "within eight to 10 years." Obama's most recent federal budget, released last spring, projects the deficit would be reduced over the next ten years, but does not forecast balance in that time. The Congressional Budget Office estimates the federal budget shortfall so far this fiscal year is $975 billion, according to a report released earlier this month - and that with two months remaining in the federal government's fiscal year. Gillespie said on CNN's "The Situation Room" that he was unsure of how many years it would take for the federal government to balance spending and revenue levels. "I'm not sure of that myself, actually," he told CNN's Wolf Blitzer. "I'll get back to you though. I'm sure it's on our website." In June, Romney told private sector leaders at the Business Roundtable that he would balance the federal budget within a decade, in large part through cuts. "I will in my first 100 days take action to eliminate government programs, to send a lot of government programs back to states - where I limit the rate of growth at inflation - and to cut back the number of federal employees through attrition," he said. "And those things save about $500 billion a year by my fourth year in office - if I am lucky enough to be elected - and get us to a balanced budget within eight to 10 years." Romney's Plan for Jobs and Economic Growth, titled "Believe in America," stresses the importance of a balanced budget, but does not lay out a timeframe. "To return the United States to the path of fiscal discipline, America must cut its government spending, cap that spending at a sustainable level, and pass a Balanced Budget Amendment to the Constitution," the plan reads. Ryan, who was announced on Saturday as Romney's running mate, said on Tuesday that he, too, was unsure when the Romney plan would achieve balance. The seven-term congressman from Wisconsin has authored his own budget plans, which many Republicans, including Romney, have received warmly, although Romney has not adopted the Ryan plan as a plank of his platform. "Well I don't know exactly when it balances because we haven't - I won't get wonky on you, but we haven't run the numbers on that specific plan," Ryan said on Fox News Tuesday. "The plans that we've offered in the House balance the budget." Former Minnesota Gov. Tim Pawlenty, a high-profile surrogate for Romney, on Wednesday defended the GOP candidate's plan. "First of all, we know that Governor Romney's plan moves towards and puts the country on a path towards balancing the budget much more rapidly and dramatically than President Obama has in mind, which is trillion dollar deficits as far as the eye can see, and the debt and the deficit growing," he said on CNN's Starting Point. For the administration's part, the budget Obama unveiled earlier this year - which was understood to have little chance of becoming law - forecast the 2013 shortfall to be $901 billion. His budget predicts the deficit shrinking to $704 billion by 2022 but does not place a premium on achieving balance in the near term. Meanwhile, Romney said in a separate interview Wednesday morning that Ryan's plan was a "a serious and important effort to try to get America on track to have a balanced budget." His plan, he said, would reach balance faster than Ryan's. And while campaigning in Ohio on Tuesday, Romney praised the state's governor's budget chops. We've got a governor here in Ohio who understands what needs to be done," Romney told supporters in Chillicothe, Ohio. "He's a guy that understands that it's government's job to balance budgets. And he did it here in the state of Ohio. And he did it without raising taxes. In fact, he cut some taxes to make Ohio a better place to create a job. Isn't that what we need in Washington, DC?" Romney's "Believe in America" plan points to his own experience balancing the budgets of the 2002 Salt Lake City Winter Olympics and of Massachusetts when he was governor. "He cut taxes nineteen times, balanced the budget without raising taxes and slashed red tape for businesses," the plan reads. "By 2007, when Romney left office, the state had accumulated a $2 billion cash cushion in a rainy day fund." On the stump this week, Romney has said his plan for economic growth includes energy independence, education, opening doors for trade and dealing with those who trade unfairly, cutting spending and shrinking deficits, and supporting small businesses. If the Romney plan as he says takes 8-10years to get to a balanced budget then during that time debt increases. Next I have been in Senior financial roles for the past 40 years in various major international company's. My experience is that to grow and when they grow they are Borrowing money, investing in the future. History says the risk reward equation favors the brave but there are casualties along the way. When they sit on cash piles as now, they do not grow but are safe, managed, and not growing or creating employmment, because there is no demand for innovation either, as consumers globally have no spare cash. Big business or small business are not job creators even if you reduce taxes as the basic ingredient of demand is lacking. The only way out is innovation investment even if it fails ala Solyndra , that equates to Romney occasional in Bain closing companies. Its the way of the world not wrong or a disaster or politically incorrect, it just happens. the best way forward is investment in the future som government funded and some private sector funded but not via Tax give aways... invest in what pays based on existing tax laws and do the risk analysis if they might change adversely. I played those out relentlessly... the uncertainty syndrome is a myth. Do we make more money is numero uno awe sh.t tax went up shucks thats life we are still winning tax is neve 100% or even 50 % of what you make!! They can't keep all of their lies straight. That happens when people constantly tell lies. Alfalfa Ryan is Snooki Palin 2012. At some point, people have to realize that Romney is just making things up out of thin air. Romney has no plan to balance the budget, he chose Ryan because he knew that Ryan proposed a detailed budget that he can plagiarism. Romney has to be honest with Americans, he does not deserve our votes and he has no plan to fixe the economy.